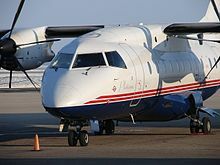 The Dornier 328 (or Do 328) program was initially started while Dornier was still owned by Deutsche Aerospace. According to Deutsche Aerospace program manager Reinhold Birrenbach, the 328 had its origins in market research conducted in and around 1984; feedback from airlines indicated a desire for a fast, quiet and easy to maintain commuter airliner with a 30-seat capacity. This market research reportedly led Deutsche Aerospace to formulate a sales prediction of 400 or greater units being purchased overall; this forecast was in part derived from the reasoning that the 328 would be more advanced than its nearest competitors. Favourable features included a high cruising speed of 345 kt (640 km/h) as well as a higher cruising altitude and range, making the aircraft almost as fast as jet airliners while being more fuel-efficient; a trend away from spoke–and-hub distribution in favour of point-to-point transit was also viewed as being favourable to the 328. In February 2015, US engineering company Sierra Nevada Corporation acquired 328 Support Services GmbH. Shortly thereafter, Sierra Nevada's owner, Turkish-American Engineer Fatih Ozmen, established a private corporation named Özjet Havacılık Teknolojileri A.Ş. at Technopark of Bilkent University, Ankara and signed a Memorandum of understanding with the Transportation Ministry of Turkey in order to manufacture the 328 at Ankara. In June 2015, the Turkish government launched the Turkish TR328 and TRJ328 regional aircraft project, a modernized 328/328JET, with either turboprops or jets for civil and military use  and a larger TR628/TRJ-628 forecasting a break even level and market of 500–1000 for each type. Existing aircraft can be sourced by 328 Support Services and converted for civil transport, military operations, medical evacuation, freighter or utility missions for $7–9 million including zero time turboprops. Sierra Nevada Corp. plans to build a new stretched 328 in Germany. 328-120 – 328 with improved STOL performance. 328-130 – 328 with progressive rudder authority reduction at higher airspeeds. 328JET – Turbofan-powered variant, formerly the 328-300. C-146A Wolfhound – Designation assigned to seventeen Dornier 328s operated by the United States Air Force's Air Force Special Operations Command (AFSOC). ^ Moxon, Barrie and Goold 1991, pp. 31–32. ^ Moxon, Barrie and Goold 1991, pp. 32–33. ^ Barrie, Douglas. "Domier details a stretched Do.328." Flight International, 29 October 1991. pp. 4–5. ^ "Sierra Nevada Corporation Expands into Global Aircraft Markets through Investments in UK and Germany – SNC Acquires 328 Support Services GmbH" (Press release). Sierra Nevada Corporation. February 6, 2015. ^ a b Moxon 1991, pp. 69–70. ^ a b Moxon, Barrie and Goold 1991, pp. 38–39. Moxon, Julian. "High Tech Commuter." Flight International, 4 June 1991. pp. 69–70. Moxon, Julian., Douglas Barrie and Ian Goold. "Do.328 Described: Friendly, Fast, and Frugal." Flight International, 15 October 1991. pp. 31–40.